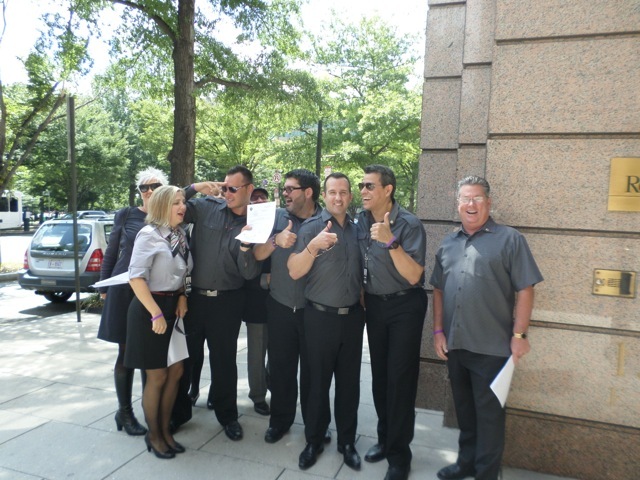 Virgin America Flight Attendants celebrate their victory at the NMB in Washington DC. The National Mediation Board (NMB) today announced that Flight Attendants at Virgin America voted in favor of union representation, garnering 58 percent of votes cast. The four week representation election began on July 16th and concluded today at 2:00 PM EDT. The Flight Attendants at Virgin America voted to have a voice in determining their collective professional future in spite of the same anti-union tactics and rhetoric that we are experiencing at Delta Air Lines. IAM Delta Flight Attendants would like to say, well done sister and brother Flight Attendants. We are proud and inspired by your successful campaign to be represented by the Transport Workers Union (TWU) and hope to follow you very soon into the ranks of the Labor Movement. Sign a card today. Let's gain a voice. We deserve it.